The Next Generation Digital Ribbon Cables with CoilGuard™ utilize a proprietary technology to allow high speed and high definition HDMI signal transmission over distances of up to 328 ft. 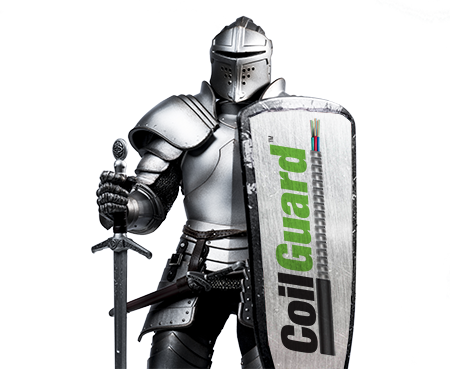 The CoilGuard™ is suitable for rough service and a short term load limit of 2000N/100mm (450lbs./4"). Digital Ribbon CoilGuard™ cables can easily handle up to 4k 60Hz 4:4:4 HDR uncompressed HDMI video and are ARC compatible. The cables meet HDMI 2.0 and HDCP 2.2 testing standards and support DDC for HDCP and EDID, PCM, Dolby, DTS-HD, and True HD Audio. The connector shells are labeled "source" and "display" to aid in proper connection during the installation. Both the cable and connector were designed to easily fit within a 1" conduit. This durable cable is fitted with a stainless steel reinforced inner jacket and a discreet outer black jacket that allows the cable to withstand rough service during and to blend in after installation. These hybrid fiber/copper cables deliver a speed of 18 Gbps video bandwidth. The advanced technology doesn't stop there with the use of four glass fibers, seven copper wires and no external power needed to supply the embedded circuitry at both ends of the cable - saving space and money. The cables come pre-terminated in convenient lengths. See the chart below for available sizes.